For the man in your life ~ a stunning 1940’s fashionable vintage bow tie. 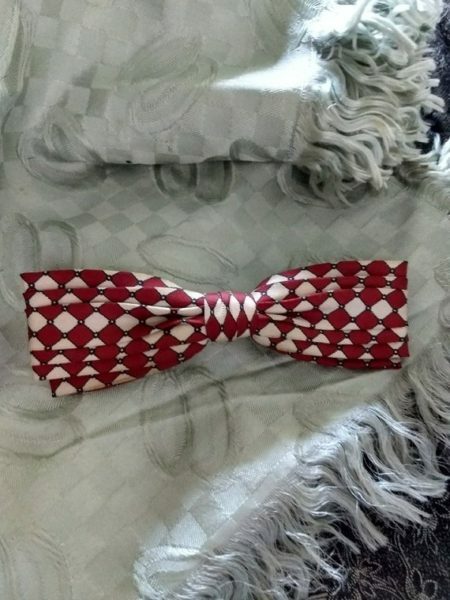 The tie, in a geometric pattern, in an Art Deco style, is hand made and hand stitched. Choice of fabric is either a silk or silk rayon in a red and white print. The top layer of fabric is made with pressed pleats. Ends of tie are fashioned in a square shape. Metal clip back, impressed with the famous Ormond NYC name.